WE SPECIALIZE IN THE SALES AND SERVICE of outdoor equipment; lawnmowers, rideons, chainsaws, brushcutters, trimmers, chippers, blowers, & generators. We offer quality repairs and service of your outdoor equipment. No job too small. No need to book in your machine, just bring it in we are open 6 days a week. WE ARE AGENTS FOR; Husqvarna, Masport, Walker, Briggs & Stratton, Echo, Flymo, Gardena, Honda, Morrison, MTD, Wolfgarten and many more. 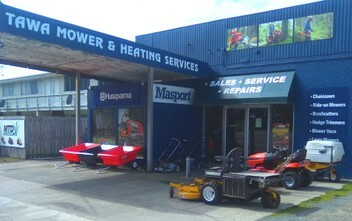 We also sharpen chainsaws, hedge trimmer, shears, clippers, axes, loppers and hand mowers. We hire out scarfiers and chippers. We stock reputed engine oils, lubricants, parts, blades, trimmer line, safety equipment and huge range of new equipment.